I used a part of the digital image from Bugaboo Digis to make this card. 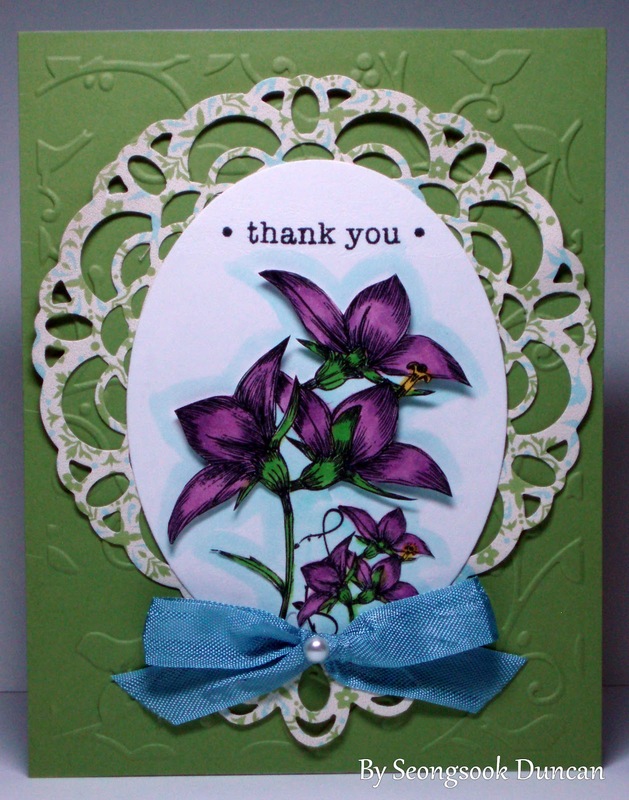 I cut out the flowers after coloring and attached it on to a white oval cardstock. I glued the bottom part of flowers down and raised each flower with dimensionals. For the layer, I used a paper doily die from SU. I cut out the center part as it will be covered anyway. I added it to the bottom of the paper doily to create an extended look. Because the oval shape won't be centered to the paper doily... Does it make sense? I like how it turned out. Looks like a fan and the handle. Oh what a cute imagination! Cindy, I had the same trouble. I used a paper shim but didn't work. I tried two pieces of plastic shim that I cut out from a spellbinder die package. I had to push it very hard to run through the machine. It worked. LOVELY! A great way to use that big die too. Love the image and the way you colored it.....it really does resemble a fan and handle! So pretty. I like how you extended the die. Clever. I've given you a blog award. Pop over to my blog for the details. I had similar problems with that die, but use a pencil to get the little pieces out. I roll it up around the pencil. I heard from a friend that a sheet of flashing would work well. :) This is gorgeous. I love your watercoloring!